It is generally acknowledged by weather scientists that a hurricane doesn't need the butterfly's intervention in order to happen; but the minute turbulence caused by the butterfly's wings might start a chain of events that, for instance, change the course of a hurricane by a few hundred meters. Once you accept that possibility, however, considering that complex weather systems might be thought of as a whole series of hurricanes just waiting to happen, you might be prepared to accept that the triggering factor might be the butterfly. It isn't meant to be an actual butterfly. 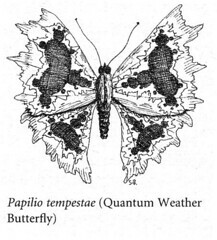 As a plot device, the Butterfly Effect is a technique whereby a small, seemingly feeble, powerless, trivial or insignificant element early on, results in a chain of events whose final consequences are very large. It differs from the Domino Effect*, Acorn Effect** and the Molehill Effect*** in that what happens is largely due to chance connections between events all of which serve to amplify the initiating event. Furthermore, many of the connections in the chain are difficult to detect or pass unnoticed. Advantages of the Butterfly Effect for writers are that no detailed explanation is required at the end since much of it is down to chance and the protagonist may even remain unaware of the root cause. For added dramatic irony, the writer can make it something he did. In fairytales this happens more often than not, through the "predisposed butterfly effect", also known as Good Karma – the hero does some minor kindness to a stranger who later turns out to have been a God/Wizard/Witch/King/Inspector of Taxes in disguise. The disadvantage is that the reader must buy into the idea. I leave that to your skills as a writer. DI Wallis (see previous post) absent-mindedly leaves his ID on the counter of Mr Patel's cornershop while investigating a robbery. The story moves on, and he sets out to catch a notorious elephant smuggler. At a vital moment, the entire machinery of justice is brought to a halt with the discovery that the Mr Patel has been impersonating DI Wallis for several months, and the Crown Prosecution Service is even in the process of opening a case against several people arrested by Mr Patel. In an added twist, several of them relate to unsolved crimes, including the elephant smuggler. The plot now takes an entirely new direction as DI Wallis and the CPS have to unravel all the cases. Captain Virgo Monsoon of the spaceship Wallis is called away from her holiday on the lagoon resort planet Mangrovia IV to deal with an urgent piracy problem in the unstable Joe Lagrange system. Upon landing on tepid humid Lagrange II, she has a difficult runaround to find her contact. Eventually they team up and start dealing with the problem, which is just getting under control when there is mysterious breakdown in communications, due to the relay on Lagrange II going off line as a direct result of a swarm of Mutant Mudskippers, multiplying like crazy, hatched originally from dozen eggs transported from Mangrovia IV on Virgo's boot. Ideally, Butterfly Effects should be more complex than either of these two, and leave even less explained. I suspect that quite a lot of time and careful tweaking is needed to form a sound butterfly effect plot. I suppose it allows the author to throw the plot in a new direction with something out of left field, which the author can show was part of the plan all along, and not lazy or bored plot opportunism ++ . In conclusion, the author who is prepared to put in the time, care and thoroughness to get the reader to buy into the idea and make the idea work well, will reward both himself and the reader richly. I would be very cautious about using more than one Butterfly Effect in the same book, or even the same series, however, since it is such a convenient device (once you get good at it) that readers will soon start expecting it. I suppose if you are feeling playful, failed butterflies, false butterflies and subverted butterflies would all enrich a story that uses them in a way that the reader is expecting. + It is often associated with Ray Bradbury's 1952 short story A Sound of Thunder, and this is very unlikely to be coincidental since the SF writers of the 1950s and 1960s were the main reading matter of future scientists of the 1970s and 1980s. However the term "Butterfly Effect" was coined specifically in relation to Chaos Theory and the example of weather systems, AND NOT to time travel! * a familiar one I hope; a conscious agent primes or sets up a sequence of events that, once the first is triggered, each will trigger the next, like a fall of dominos. ** Vegetable and inevitable, do mighty Oaks from tiny Acorns grow. The Acorn Effect is generally natural, always slow, visible and quite passive. *** To "make mountains of molehills" is to treat something as much more significant than it really is. The Molehill Effect is when a person or group of people through their attitude to something trivial, end up turning it into something momentous (and usually unpleasant; such is the nature of irony). ++ I will deal with this another time.